Body Xtreme Fitness 6-in-1 is an elliptical exercise bike and home gym equipment that comes with an ab twister, small hand weights of 2lb and 3 lb, push up bars, resistance bands, pulse sensors as well as a bonus cooling towel. It is a very new release product that is one of the better selling ellipticals on Amazon.com and there are only a few customer reviews so far. Body Xtreme 6-in-1 offers a low impact type of workout with the natural elliptical motion and there will be as little impact on your ankles, joints and back as possible. You can fasten the resistance bands to both the front and rear to experience the extra challenge and burn more calories or strengthen and tone your muscles. There is also the resistance dial to adjust the level of difficulty for your different exercise needs and goals. It has the elevated momentum fan blades that will generate a nice breeze as you cycle. The strengthened crank system will ensure consistent momentum at all times. The seat is adjustable for height to accommodate different people and you can also use this unit standing like a cross trainer anyway, as you can tell from the shape of the large pedals on the photo. We’re not sure of the comfort level of the seat yet but is a good size one and should have more than adequate comfort level contrary to what the image shows. These pedals have the anti-slip ribbed dot surface and you won’t be slipping during your workout. The handles have the cross trainer style and they feel solid and have an ergonomic design. You’ll also find the sensors on these handles that are connected to the LCD display panel and see your accurate heart rate reading. The smart design panel with five small displays shows the distance, speed, calories burned, pulse and level of tension. The blue, silver and black Body Xtreme Fitness 6-in-1 measures 43.4 x 19.7 x 61 inches without the resistance bands and the ab twister. It is also lightweight and with a relatively small size, you can easily relocate and store it somewhere convenient. The total user weight capacity is specified as 220 pounds so people that weigh more than this (approximately 100kg) should look at alternative models on Amazon through the links on this page. 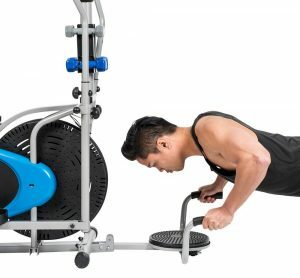 With the pushup bar, you can work your chest and deltoid muscles efficiently. As the name suggests with the Ab Twister you will get a decent abdominal workout especially targeting your obliques. You can work on your lower body, core section, biceps and triceps with the resistance bands included in the box. You can do backward strides on this unit and target slightly different muscles. The small weights are great for use when you’re sitting and pedaling so you keep your upper body active simultaneously. It requires some assembly but is not difficult to put together and you can do it in less than an hour especially if you have someone helping you. You may want to put it on a hard surface rather than on a thick carpet so that it doesn’t get wobbly during your workout. Overall it appears to be a great value fitness equipment at a reasonable price, considering it is a six in one.